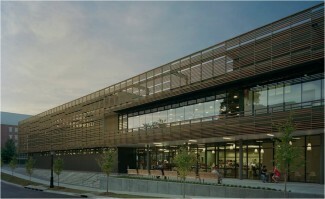 Design Garland Center, a mixed-use gateway to the University of Arkansas consistent with UA planning guidance for this campus sector. Include a 1500-car, 6-level parking garage along with retail tenant space and the University Bookstore. The garage is required to be efficient, intuitive in use and enticing for the patron. Retail lease space along Garland Avenue should add shopping convenience and visual interest at pedestrian level. A two-level Bookstore plus coffee shop and store-within-a-store brands must add “wow” factor to be successful. Consistent with University goals, Garland Center should be designed and built to sustainable criteria equivalent to LEED Silver. Budget and challenging schedule requirements had to be met.